The Values2Wellbeing Program is an award-winning coaching method developed by high-profile scientists and coaches to increase life satisfaction and reduce detrimental stress through life-values alignment. You will be among the first coaches and researchers certified to use our proven “Values2Wellbeing” strategy with your clients, starting with their first session. You will receive a strong background in the newest wellbeing research, summarized in concepts and interventions that can be used in coaching. You will earn a total of 41 Continuing Education Units, 26 Core Competency and 15 Resource Development you can use toward ICF certification renewal. When we began to study people’s value systems, we quickly observed that we hold two completely different sets of values. Core values are what we truly are. In a sense, they are our psychological DNA. When our thoughts and actions align with our core values, we are at our best. Acquired values are what we have been taught and have accepted is most important for doing well in life. Deeply held acquired values come over a lifetime from various sources – parents/guardians, friends, schools, work, language, movies, music and literature; technology, and business, to name a few. We need to be aware of how strongly our thoughts, emotions, and decisions are influenced by both our core and acquired value systems. Unless we consciously evaluate and choose which values to respond to, we tend to favor our acquired values, swimming or sinking in a river of daily demands, reacting to what seems most pressing or what seems to offer the quickest gratification. But here’s the problem: Because acquired values don’t reflect what innately matters most to us, efforts driven by them bring us only short spikes of satisfaction. People who invest heavily in their acquired values while ignoring their core values often find themselves physically and emotionally exhausted, and hungry for meaning, purpose, and genuine fulfillment. The “Values2Wellbing” Program is specifically designed to help people fully understand their value systems. We will teach you how to help your clients identify and prioritize both their core and acquired values in a three-session coaching package. With this awareness they will be able to strengthen their personal core value-based decision making system. As a result, they will experience lasting increase in levels of well-being, better motivation for work, more harmonious relationships and a feeling that their life is more purposeful. The study behind Values2Wellbeing was conducted by Senka Holzer, PhD, and won the 1st Place Research Award at the 2015 Coaching in Leadership and Healthcare Conference, organized by McLean Hospital’s Institute of Coaching, and Harvard Medical School. Senka partnered with Michelle Payne, Master Certified Coach, and Carole Bennet, MBA, Professional Certified Coach to develop this systematic process that showed effective in reducing stress and increasing life satisfaction. 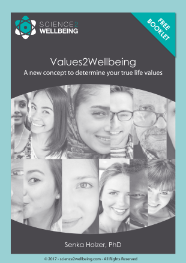 Join our mailing list and receive your own free copy of “Values2Wellbeing” booklet! It will help you understand where your values come from, how they influence your decisions and what you can do make your core vs. acquired value systems more internally consistent.